Fine lines and wrinkles can give away your age or even make you look much older than you really are. 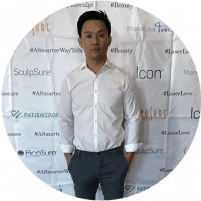 Aaron Jeng, MD, the physician at Beau MedSpa in Glendale, California, does Botox® treatments to eliminate lines and wrinkles without surgery. Use the online booking tool or call to schedule your Botox appointment now. Botox is the most popular noninvasive cosmetic procedure today. It smooths wrinkles and prevents those wrinkles from forming again for several months. Botox is a neurotoxic protein derived from Clostridium botulinum. The FDA approved Botox for use in wrinkle reduction in 2002, and it’s grown in popularity ever since. At Beau MedSpa, highly skilled physician Dr. Jeng performs all Botox injections himself using an ultra-thin needle. Where can I get Botox in my face? Although not as common, some patients request Botox in the lines around the lips as well. Botox is used for dynamic wrinkles, the type of wrinkles that appear when you move your facial muscles. It’s a great solution to temporarily slow muscle movement and smooth away wrinkles, but it can’t plump up deep-set facial folds or make any area of your face fuller. For that type of correction, you need a dermal filler like Juvéderm® or Restylane®. In most cases, Botox lasts for 3-4 months. If your goal is long-term wrinkle correction, simply schedule maintenance treatments several times a year. Over time, you may need Botox treatments less often because a consistent supply of Botox is always in your body. Botox is most effective for long-term wrinkle correction if you have maintenance treatments before the product has totally worn off, so don’t wait until your wrinkles are just as bad as before to get future treatments. Can I get Botox at the same time as Juvéderm or Restylane? Yes, in fact, many Beau MedSpa patients opt for a combination of Botox and dermal fillers to correct their cosmetic concerns. Static wrinkles, the lines and folds that are always there, even when you’re not making facial expressions, don’t respond to Botox, but they respond well to dermal fillers like Restylane and Juvéderm. If you’ve got forehead lines and crow’s feet, but you’re also worried about the deep folds around your nose and mouth, Dr. Jeng may recommend a combination approach with Botox in the forehead and a dermal filler in the facial folds. You can get Botox and dermal fillers in the same appointment, which usually takes only around half-an-hour. Book your Botox appointment online or call the Beau MedSpa team to schedule now.